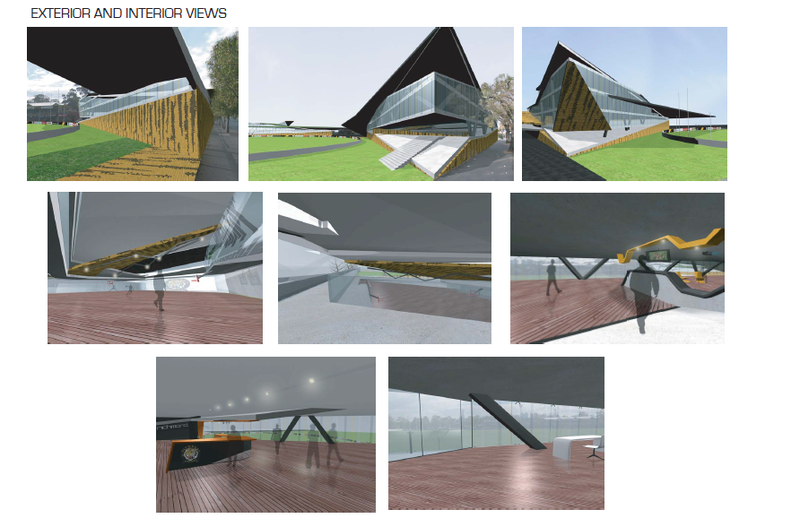 I once again delve into the Laurence Dragomir RMIT School of Architecture and Design archive today, this time focusing on a Punt Road oval rebirth from way back in 2008. Part of a design studio titled "Football, Meatpies and Holden Cars" it was run by RRR's The Architects very own Christine Phillips and centred around the redevelopment of Punt Road alongside the point where Suters Architects were developing their scheme which has since been built. 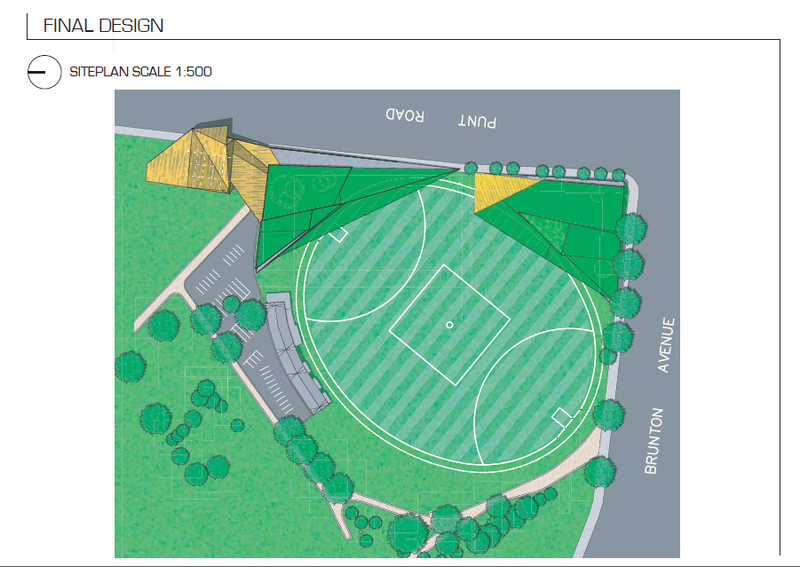 The schemes developed were to house the Richmond Football Club's administration, training, membership and merchandise facilities in addition to some provision of community shared space. Punt Road oval montage framing the Jack Dyer Stand. Now this isn't a real scheme so certain liberties have obviously been taken - personally if I had my time again I'd likely reconsider the visual expression of the Punt Road elevations. More than anything I'm hoping this might encourage architecture students out there that read the site to get in touch and publish their projects on Urbam Melbourne. Note this was during my McBride Charles Ryan-inspired origami phase which also appeared in last week's Fed Square East two part-icle. 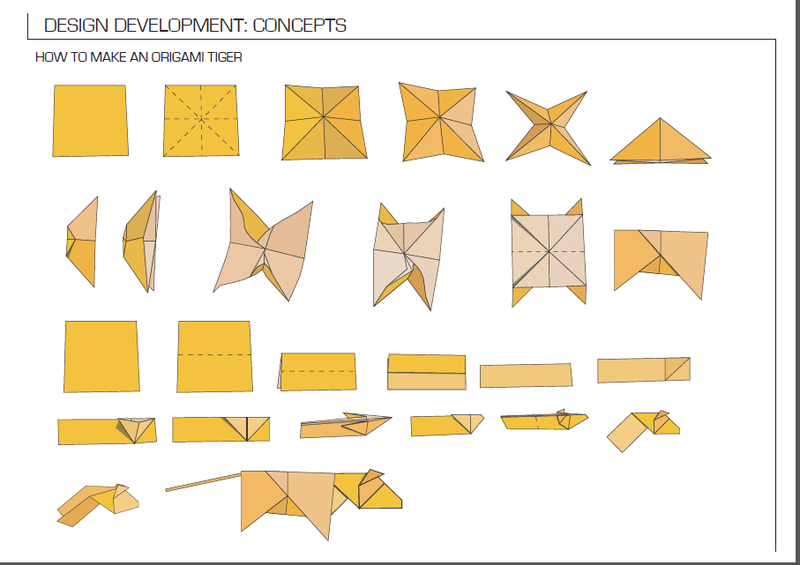 The basis for our final design is the origami tiger as a means of generating form. The rationale behind this approach is origami which started as the Chinese art of paper folding. In Chinese there is a phrase, ‘zhi laohu’ which translates to ‘paper tiger’ in English. The term refers to something which appears ferocious but in reality is as harmless as paper. We are of the belief that this is the view held by oppostion supporters and the Football world in general, with regard to the Richmond Football Club's premiership aspirations. In recent times the Tigers have teased with glimpses, that time and time again have resulted in nothing more than a ninth placed finish. A gutsy, hard fought win is often followed by a battering from a top 8 side the following week and/or vice versa. By scaling up the origami tiger and applying the wallpaper of the 5 Richmond ‘Immortals’ (Jack Dyer, Francis Bourke, Kevin Bartlett, Royce Hart & Tom Hafey) in the form of brickwork, we are providing this ‘paper tiger’ with strength and an intimidating aura, as it dominates its site along Punt Rd like a fortified base. Its siting allows for the framing of the Jack Dyer Stand between the two larger volumes as Building 02’s roof cantilevers overhead. 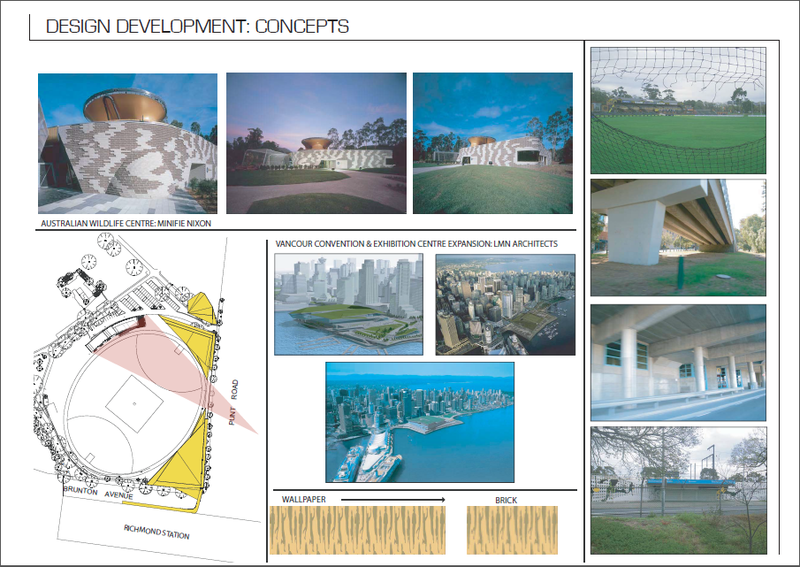 From an site perspective the origami tiger has been employed as a large scale urban gesture that provides infill development to the awkward wedges that are the subsequent result of placing an oval on a largely rectangular site. The grassy knolls which become occupied are transferred to the roofs of the buildings providing another elevated viewing vantage point. 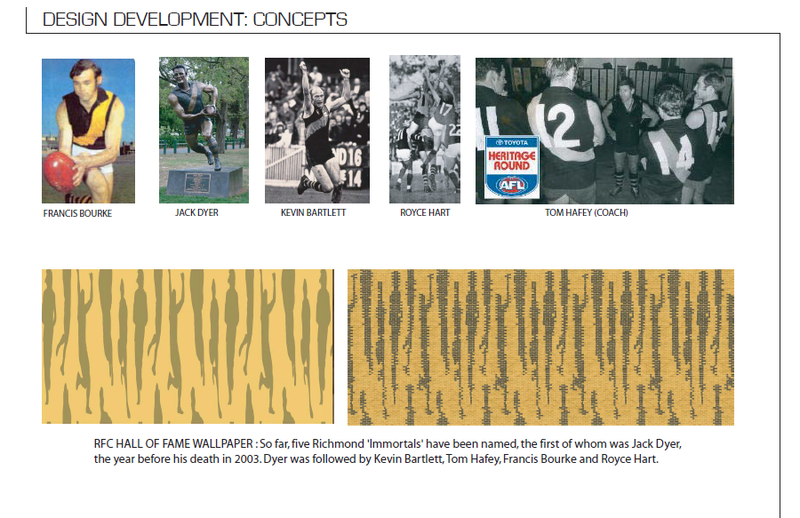 In doing this it also provides a visual connection to the Jack Dyer Stand from Punt Road oval while also creating a pedestrian link to Richmond Station by way of the tiger's tail which becomes a bridge over Brunton Avenue. The form of the tiger isn't immediately understood particularly at street level - this only really becomes apparent once the observer is elevated. Please enjoy the slideshow below which illustrated the design development process via a series of diagrams. If nothing else I hope at the very least you come away from this with the knowledge and ability to make an origami tiger. Until next time. If you're an aspiring student with a design to share, send an email my way and more likely than not you'll find yourself on Urban Melbourne. How to make an origami tiger. Various interior and exterior renders.